Itʼs already that time of year again. Does your Girl Scout need something to do this summer? We have lots of options for day and overnight camps. Theyʼre great opportunities for girls to meet new friends, learn about different topics, and possibly even earn a new badge. 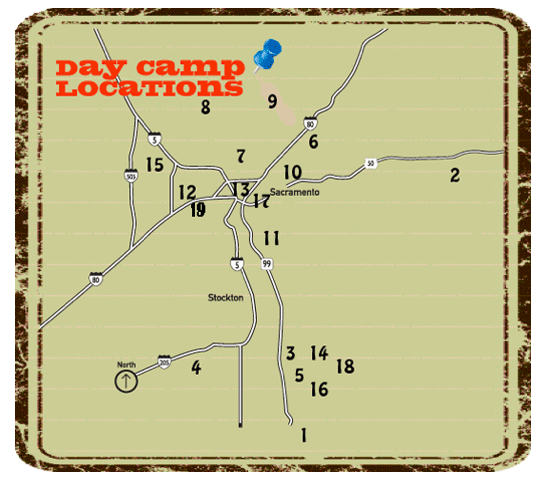 Camp Menzies is our overnight camp in the Sierra Nevada Mountains, with sessions ranging from 4-8 days. Thereʼs something for everyone entering grades 2-12, with themes ranging from outdoor activities and sports to jewelry making and art. Girl Scouts can learn survival skills, explore San Francisco or Tahoe, or help build a cabin. Click here to see all the sessions and register now. Questions about camp? We have lots of info on our Web site, from ﬁnancial aid to preparing for camp. Check it out! Click here to ﬁnd out more about the themes, locations and dates for all 19 day camps. Your daughter can even bring a friend – girls who arenʼt in Girl Scouts can attend, they just need to pay an additional $12 membership fee. We also need adults to volunteer at day camps and work at Camp Menzies if you have free time this summer. What is your Girl Scout planning to do over summer break? Leave a comment on this post and let us know! Previous Post Make the Most of Your Summer at Camp!